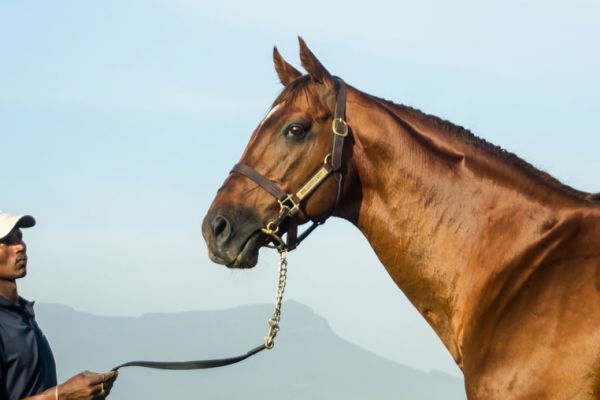 Drakenstein Stud’s resident sire Philanthropist enjoyed another highly successful weekend, when represented by four winners- on two different continents. The strapping chestnut had a pair of winners in South Africa on Friday, and followed that up with a quickfire double at Woodbine on Sunday. Philanthropist’s four timer kicked off when daughter No Doubt broke her maiden over 1600m on Friday. Just one race later, Philanthropist’s smart 3yo son En Gee Oh waltzed home to score by two and a half lengths over 1800m. The Gavin Smith trained colt, now a three time winner, had previously finished third in the Listed World Sports Betting East Cape Derby. The soul of consistency, En Gee Oh has won or finished in the money in all twelve of his career outings and he won’t stop here. Philanthropist also had a good double at Woodine just two days later, when his son Shot Gun Phil won his first race over 1300m and daughter Hidden To Win picked up her fifth victory when also successful over 1300m. The well bred Philanthropist, whose relatives include US champion and Hall Of Fame member Inside Information as well as former top class South African sire National Assembly, is also the sire of Gaenari, who was third in Sunday’s Ttukesom Cup in Seoul. The son of Kris S, who has a close relative on offer at the 2017 Klawervlei Farm Sale (Lot 12), is covering sire on four lots at next week’s Mares, Weanlings & Fillies For Stud Select Sale at Highlands.